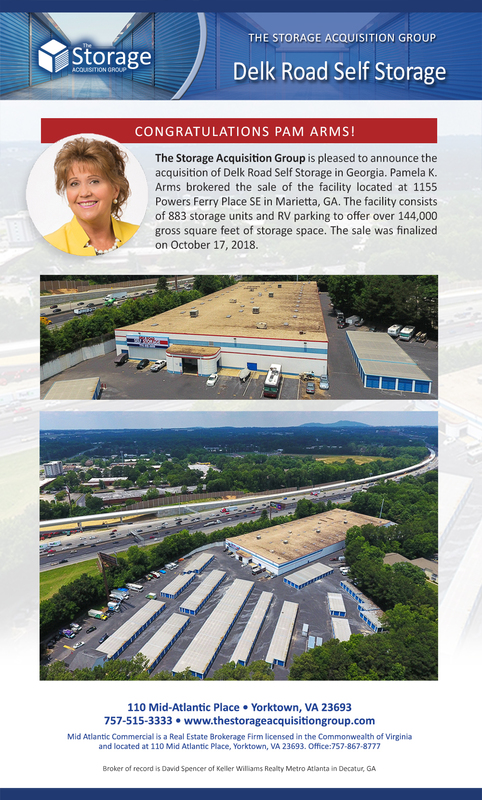 The Storage Acquisition Group today announced the sale of Delk Road Self Storage in Georgia. The facility is located at 1155 Powers Ferry Place SE in Marietta. The sale was finalized on Oct.17, 2018. The sale was managed by group Vice President Pamela K. Arms and group President and CEO Cowles M. “Monty” Spencer Jr. The facility totals over 144,000 gross square feet and has 883 storage units. The property offers climate-controlled units, electronic gate access, video surveillance and an excellent location along I-75. Located just 18 miles from downtown Atlanta, Marietta is a thriving community within Cobb County. In addition to its historic charms and natural landmarks, Marietta is home to over 100 Fortune 500 companies and shows continued growth in many key industries such as aeronautics, health services, hospitality and more. The Storage Acquisition Group is the premier agency for owners of self-storage facilities or portfolios presently considering opportunities for acquisition. Recognized across the industry for its owner-friendly acquisition process and providing fair market values with the lowest possible transaction costs to the owner, The Storage Acquisition Group prides itself on an open and communicative process. With decades of combined transactional experience and an integrated network of industry-related consultants, the group is equipped to offer solutions on even the most complex transactions. To learn more about The Storage Acquisition Group’s unique model, visit http://thestorageacquisitiongroup.com/. The Storage Acquisition Group is a division of Mid-Atlantic Commercial Real Estate located at 110 Mid-Atlantic Place in Yorktown, VA 23693. Pamela K. Arms is vice president of The Storage Acquisition Group, a division of Mid-Atlantic Commercial Real Estate. Cowles M. “Monty” Spencer Jr. is president and CEO of The Storage Acquisition Group, a division of Mid-Atlantic Commercial Real Estate.